The project started in September 2013 and will run until end of November 2016. S2Biom is co-funded by the European Union within the 7th Framework Programme. Grant Agreement n°608622.The sole responsibility of this publication lies with the author. The European Union is not responsible for any use that may be made of the information contained therein. 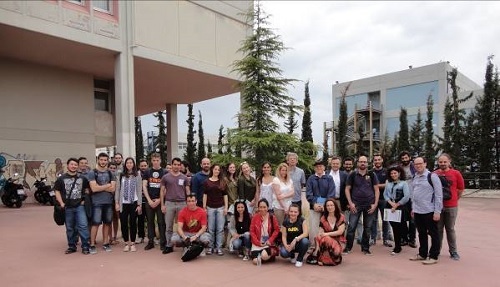 This S2Biom newsletter issue informs about several events which have been organised in S2Biom project during the last months. These events have been a part of S2Biom toolset validation work. Toolset has been presented and validated among students, researchers, business representatives from all over the Europe. The special focus has been made for dissemination of project results to South-Eastern European countries. The newsletter also informs about the upcoming final conference of the S2Biom project which will take place in Bratislava, end of November, 2016. In May and June, 2016 S2Biom Toolset has been presented and validated in three events. In September the third S2Biom tool presentation webinar took place. On 9th of June, 2016 on the occasion of the 24th European Biomass Conference and Exhibition (EUBCE 2016) the S2Biom project workshop has been organized. The workshop gathered 53 participants coming from 21 different countries. In the event the latest results of the project have been presented and developed tools have been demonstrated (see agenda HERE). Presentations were concluded with extensive discussion round. The main addressed issues were potential target groups of the toolset, limitations, availability of data, possible extensions to regions outside Europe and follow-up activities after the end of S2Biom project. Workshop presentations can be downloaded HERE. The 2nd S2BIOM Dissemination Conference for the promotion of project results took place on 16 June, 2016 in Piran, Slovenia, in the framework of the 2nd South East European Conference on Sustainable Development of Energy, Water and Environment Systems. The Conference has been tailored as a half-day side event within the 2nd SEE SDEWES Conference in order to reach out to a large audience of experts and practitioners form South-East European Countries. Around 30 participated at the event. During the first session a detailed insight into the structure and functionalities of the S2Biom toolset has been provided. The second session of the event provided extensive overview of the strategic case studies that, in the framework of S2BIOM, have been implemented in SEE. Experts form Slovenia, Croatia, Romania and Greece presented the specific activities that have been carried out at local level. In the third session participants had an opportunity to test the S2Biom Toolset and interact with the project experts. Agenda of the conference and presentations can be downloaded HERE. A webinar of S2Biom Biomass & Technology Matching tool ‘Bio2Match’ has been organised on 15th of September, 2016. Bio2Match has been developed in the S2Biom project. The tool guides the user in selecting the optimal match between available biomass resources and conversion technologies. Each biomass conversion technology has specific biomass input requirements, while the composition and characteristics of biomass at roadside varies widely. Some biomass types can be used in many different technology options, while others are hard to process or will need extensive pre-treatment. Bio2Match uses extensive information from the S2Biom databases to show the user which types of biomass can be processed by which technologies to certain end-products, and thereby helps the user to find an optimal supply chain. In this webinar the tool developers described the data and methodology behind Bio2Match and demonstrated how the tool works. Participants were provided with access to the online tool and received support information on how to use it. Presentation from the webinar can be downloaded HERE. S2Biom project final conference will be organised on 30th of November, 2016 in Bratislava, Slovakia. The event will be held back to back with the “SET Plan - Central European Energy Conference X“. Detailed agenda will be soon published on S2Biom website.